Live like you're on vacation! Water views from every apartment, stocked private lake. 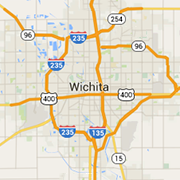 Minutes from Hawker Beechcraft, Cessna, Boeing/Spirit and McConnell Air Force Base. The Jamestowne Houses in Southeast Wichita are residences that offer more than ordinary apartment living...it's like residing in a private home. An address you’ll be proud to call your own. Marina Point offers a comfortable lifestyle in a truly distinctive location. Located in the heart of a lovely, tree-lined neighborhood... An unexpected pleasure awaits you! Easy and convenient rental apartments located in South Wichita with short term and long term lease options. We offer a variety of floor plans to meet your needs... studio, one, two and three bedrooms featuring spectacular lofts and townhomes. This community is designed with all the comforts and conveniences for residents who are aged 62 or better. Luxury studio, one and two bedroom apartments in Wichita's resort community. Quality, affordable apartment living in newly renovated units with a washer and dryer in each unit. Hardwood floors are available in most units. Pets welcome! Your vacation spot right at home, ALL ADULT Resort Living in the City. A small quality-oriented community, privately nestled into beautiful, large trees, Virginia Oaks has your choice of one and two bedroom apartments. Westlink Village offers all the convenience of full-size washer/dryer set in a great location, yet is tucked away just enough to radiate the serenity of a residential setting. Whether you are looking for a temporary or permanent home, you will find our caring management team at Wildwood committed to you. We offer a large selection of floor plans to choose from, including one and two bedroom plans and two bedroom townhomes.